Do you need a crane & operator for a move? Let Can Ridge take care of everything! The Can Ridge team is built on a foundation of crane expertise. 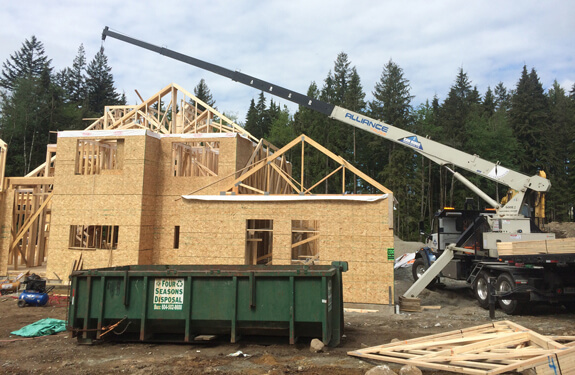 We provide crane solutions to clients all across British Columbia. We have a crane for every job site, tight space, or wide open wilderness. Whether it’s extremely heavy building materials or valuable machinery assets, we have moved, lifted, and hoisted it all. We provide crane rentals with qualified crane operators exactly when and where you need them. We pride ourselves on getting the job done faster than the rest while keeping safety a top priority. We have both stiff boom cranes and folding boom cranes to get the job done. We can accommodate lifts of up to 55,000 pounds, while also providing onsite knowledge to aid in the complex rigging and hoisting maneuvers that will be required. No matter the scope, you can rely on Can Ridge to see your project through from beginning to end. Hire Can Ridge for all your crane rental needs. Our professional team of crane operators have the expertise and know-how to get the job done right! Our crane rental rates are highly competitive. Contact us and let’s talk about your crane and hoisting needs!